"Into the Wild Green Yonder Part 4" is the eighty-eighth episode of Futurama, the sixteenth and last of the fifth production season, the sixteenth and last of the sixth broadcast season and the fourth and last cut from Into the Wild Green Yonder. It aired on 30 August, 2009, on Comedy Central. The Feministas are sent to prison, while Fry finds the Dark One whose mind he can't read. After a quick recap of the previous episodes, the plot resumes at the Earth Supreme Court, where the Feministas stand trial by the court lead by Snoop Dogg's head. The Feministas are charged for several crimes, including protecting the environment. Nixon, Bender, Fry and Leo Wong are witnesses at the trial. The vote by the judges is 5-4 to acquit. However, the female judges' votes only count half, and so it is 4-2.5 to convict. After the start of the introduction and the caption from the film, Fry is seen on Planet Express' balcony, he says "previously on Futurama". 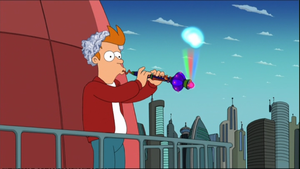 He plays his holophonor and the camera zooms into the holographic cloud before the recap begins. This is a reference to "The Devil's Hands Are Idle Playthings", which was the final episode of the original run, an obvious reference to this possibly being the final Futurama episode at the time of it's broadcast. Leo Wong isn't seen testifying. Justice Dogg doesn't close with "Peace" after handing out the verdict. Fry doesn't say "The name "Omega Device" sort of conjured up something cooler looking. Not that I'm disappointed or anything." No mention is made of farting, or the need to be at point blank range. Leela doesn't say "That's right. He's been living off me since we got captured." Amy's line "Bender, is that you?" became simply "Bender?" Bender's confusion about nutmeg is edited out, so that in this version he simply forgot about the guards. Zapp doesn't say thanks to Kif after sitting on his shoulders. Leo doesn't warn Fry "careful those wires." Nixon's head's thoughts aren't heard. Calculon's line about his operating system, Windows Vista, was changed to Windows 7. Amy's mother doesn't say her name in surprise. This page was last edited on 2 September 2013, at 10:25.